More than 100 flights have been cancelled as French air traffic controllers go on strike again. Ryanair said it was "forced" to cancel 22 flights on Wednesday (September 14) and 72 on Thursday as a result of the 14th French ATC strike this year. EasyJet cancelled 64 flights on Thursday, including 22 due to operate to or from the UK. British Airways has offered customers due to fly to or from France on Thursday the opportunity to rebook. The airline will use larger aircraft where possible to enable passengers whose flights are cancelled to reach their destination. The airlines warned passengers that in addition to the flights that were cancelled, a number of others are likely to be delayed. Lobby group Airlines for Europe (A4E) - which represents airlines such as easyJet, Ryanair and British Airways' parent company IAG - has called for the European Commission and governments to take action to reduce the impact of ATC strikes. A British Airways spokeswoman said: "Yet again the French air traffic control trade unions are causing unnecessary frustration and disruption for customers. "We continue to urge the French government and the trade unions to resolve their issues so that customers can go on their holidays and business trips without these frequent threats of strike action hanging over them." 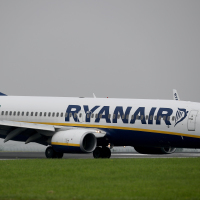 Robin Kiely, head of communications at Ryanair, said the strikes will affect hundreds of thousands of European consumers, throwing their travel plans into chaos. He said: "It's reprehensible that Europe's consumers repeatedly have their holiday and travel plans disrupted or cancelled by the selfish actions of ATC unions, who use strikes as a first weapon rather than a last resort." He called for the the European Commission to take action to stop repeated ATC strikes from "continuously disrupting the travel plans of millions of Europe's citizens and their families." A spokesman for the EasyJet said the airline is "disappointed at this unnecessary strike action causing further disruption for passengers and airlines across Europe." Travellers can go some way to protecting themselves from flight delays and cancellations by taking out travel insurance.